Street vendors in the Kasbah des Oudaias. Along the Atlantic Coast, on the banks of the Bou Regreg river lies the fortress of the Kasbah of the Udayas. 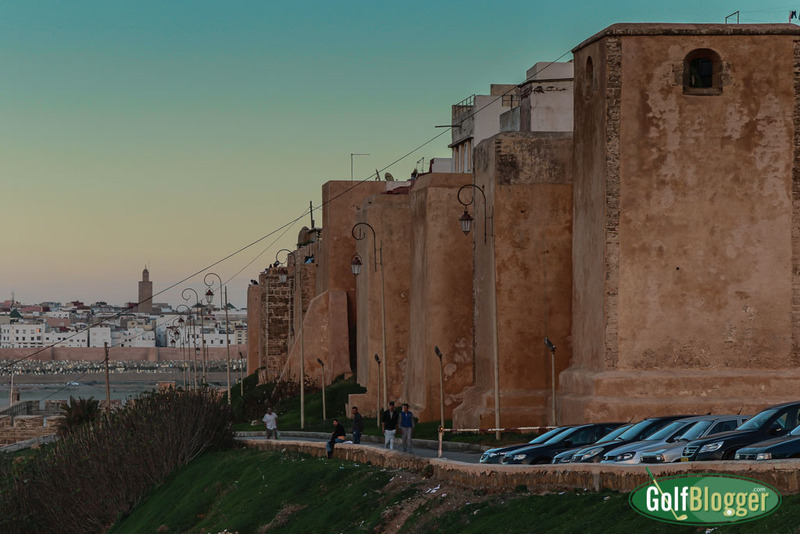 The oldest part of Rabat, the fortress was built during the Almohad Caliphate (1121 – 1269), and today contains a collection of homes and shops. Rabat, incidentally, comes from the Arabic for Fortified Palace and refers to this fortress. 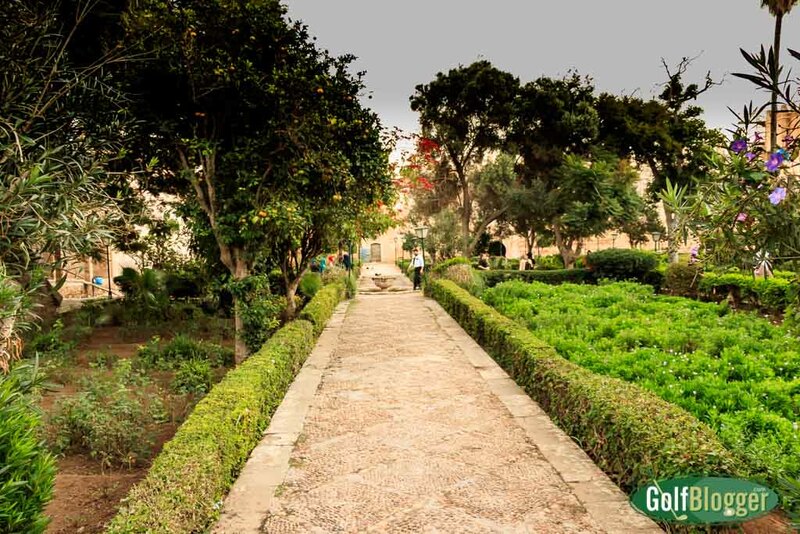 Nearby are the Cemetery of the Martyrs, the Kasbah Mosque and the Andalusian Gardens. Walls of the old fortress in Rabat. I visited Rabat’s old town as part of a trip arranged by the Moroccan National Tourist Office. If you take a golf vacation to Morocco, be sure to take the time to visit the cultural sites. As good as the golf was, I wish that I had more time to spend exploring the history and culture. Within the walls of the fortress, the Kasbah des Oudaias is a exotically romantic labyrinth of narrow streets, flanked by white and blue walls. Hidden within these walls was a restaurant that had a spectacular view of the waterfront and the adjacent neighborhoods. I would have loved to spend a leisurely evening there with a meal and a good cup of coffee. 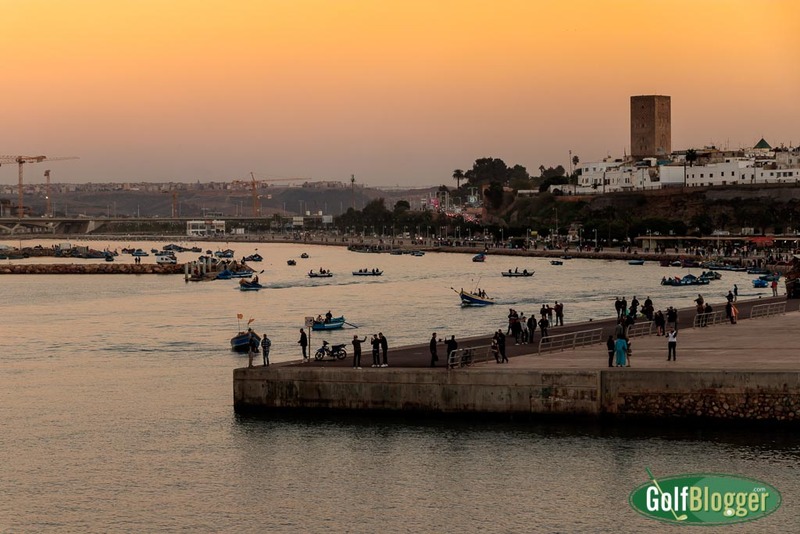 The Bou Regreg River separates the cities of Rabat and Salé. 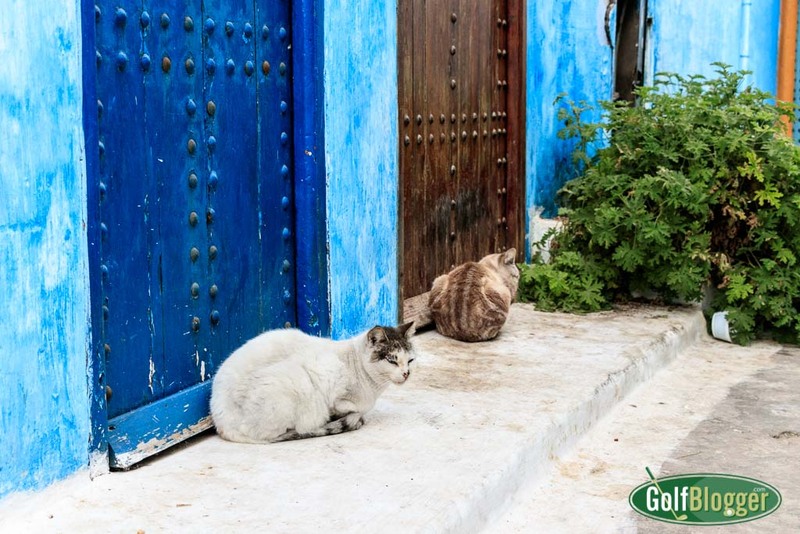 The streets of the Kasbah des Oudaias are home to a great many cats. Cats were everywhere in the Kasbah des Oudaias. Adjacent to the Kasbah des Oudaias is the Andalusian Garden. The garden is in a large courtyard, laid out in a formal structure with orange trees, palms, hedges, hibiscus and other flowering plants. Also nearby is the Cemetery Chouhada, which is both eerie and beautiful. Just across the street and a couple of blocks down from the Kasbah des Oudaias is Rabat’s souk. The Martyrs Cemetery, Cimetière As-Shouhada’, just outside the Kasbah des Oudayes, the old city of Rabat. More photos from my trip to Visit Morocco: Old Town Rabat, the Rabat fortress, the Kasbah des Oudaias and the Andalusian Gardens follow. Read more about my trip to visit Morocco at this link. A tower outside the Andalusian Gardens. A street in the Kasbah des Oudaias in Rabat, Morocco. 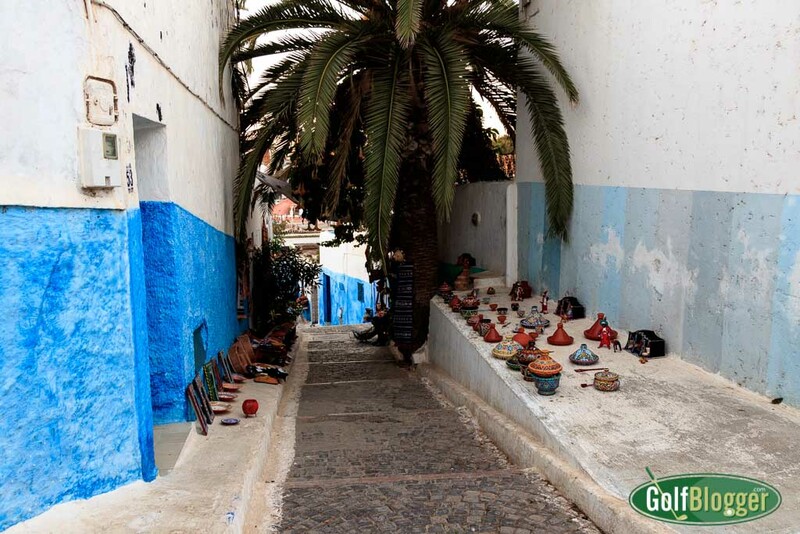 Walls of buildings in Rabat's old city are painted blue. An entrance to the Kasbah des Oudaias, the old city of Rabat. 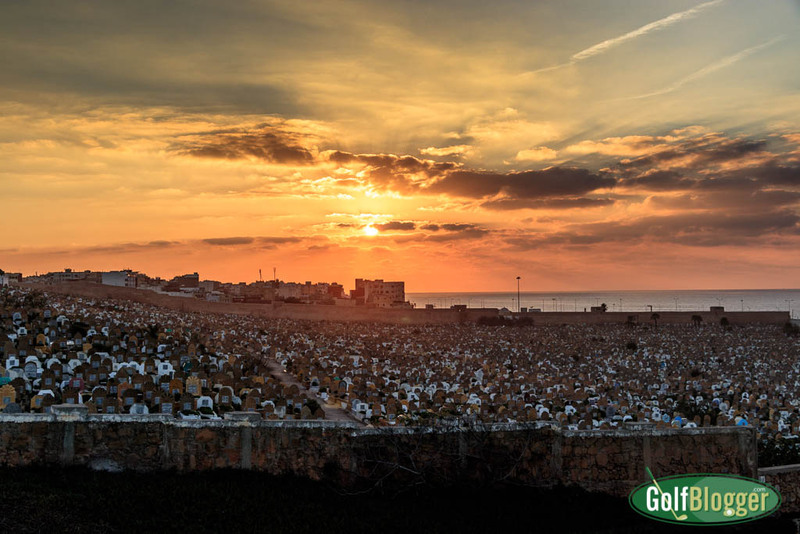 The Martyrs Cemetery, Cimetière As-Shouhada', just outside the Kasbah des Oudayes, the old city of Rabat.